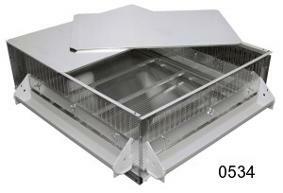 GQF Box Brooder is made of plastic & aluminum. Each side panel comes with adjustable gates to regulate openings for chick type and age so they have access to feed & water. Purchase a chick feeder and water fount for use with quail/bantam chicks. Clear front plastic panel allows easy viewing inside the brooder. ½” wire floor allows droppings to fall through to the removable drop pan. Has 250 watt heat element & wafer thermostat control. Is 38” l x 32” w x 12” h (9 ¾” interior height). 2-part lid makes brooder cleaning easy. Capacity of 0534 - app. 100 poultry chicks to 2nd. 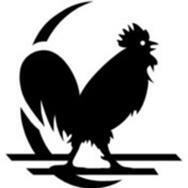 week or 100 quail or 50 chukars or pheasant chicks to 4th week. For quail or bantam chicks, cover the wire with paper towels or a DACB sheet for the first week. Comes with 2 brooder bulbs. until the first week in May. 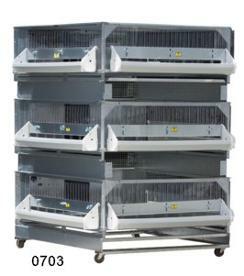 Game Bird / Poultry Brooder comes with a thermometer & three 28 ½” troughs for feed & water. Grow-off Pen - same size & specifications as 0534 brooder, but there is no heat. 5-Deck Battery Grow Off - same size & specifications as 0540 battery, but there is no heat & but comes with top lid only. Start & Grow with caster base has one 0534 heated brooder & two 0701 unheated grow-off pens with 0525 extenders to give 14” head room for growing birds. Comes complete with troughs, caster base, and 2 attraction bulbs. 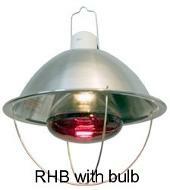 5 7-watt brooder/attraction bulbs Specify red, blue, green, or white when ordering. This catching partition may be inserted through the front or side sliding doors to herd birds to the front of back of the brooder. Birds may then be removed from the front sliding door or the back sliding door. Screw on the bottom of the partition and go through the 1/2'' mesh wire floor to hold the partition in place. Brooder chick catching partition screws into brooder floor to keep chicks in confined area so they can be caught. 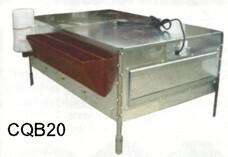 Brower’s CQB20 galvanized brooder, pictured right, has these features: ½” x ½” PVC wire mesh floor, drop pan, front & side openings covered by ½” x ½” poly mesh, outside feed trough which measures 4” x 27”, 3-liter drinker, & 2-piece removable top, thermostat control, 110 V 250 watts. Use the brooder in a room with a temperature 50° or above. Sliding door panels cover 1 side & the front to keep it warmer the first few days. 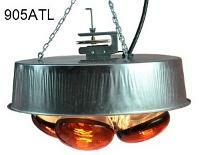 Size: 27” w (33 w with feeder & drinker), 42” l x 19½” h (10” inside h). Requires 2 BB-5 bulbs. Capacity:124 day-old chicks, 100 1 week-old, 50 4 week-old. 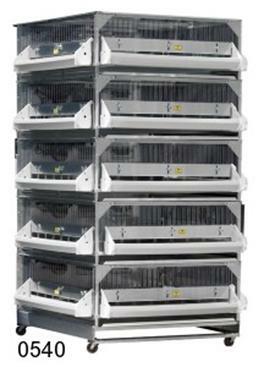 Quail capacity: 100 to 4th week. Up to 4 CQB20 or 4 CGO10 will stack on one QCB500 caster stand. To create a start & grow unit buy any combination of CQB20 & CGO10 plus 1 QCG500 caster base. Grow-out pen - same size & specifications as CQB20 except there is no heat. Holds 24 chickens requiring no more than 9” headroom. are drop-shipped from Brower in Iowa. Allow 2 weeks for delivery. Price increases effective 3/8/19. Kuhl 34-inch canopy LP or natural gas brooder has a wafer-thermostat control & has continuous temperature sensing modulation S.I.T which modulates from 17,000 - 30,000 BTUH to warm an area for brooding up to 1,500 chicks. Specify LP or natural gas when ordering. Single lamp brooder has 10.5” metal reflector with double wire bulb guard, heat-resistant porcelain socket, & a 6’ heavy duty cord with polarized male prongs. GQF 0470 heater, pictured above right, comes with a wafer thermostat for more accurate temperature control. There are two chains with “S” hooks to adjust the height of heater above birds. Use to floor-brood ratites, game birds, or poultry chicks. With a room temperature of 65° this 600 watt heater maintains a 95° temp. for brooding app. 250 quail chicks. Size: 26” x 6” x 6”. Drop-shipped item.